There are a huge number of wineries to be found in Northern California but being a huge movie buff one of the highlights for me had to be the Francis Ford Coppola Winery. As well as traditional Italian style wines they have an amazing on site tourist destination including a museum, restaurant and kitchen store. The gates are postcard worthy with a view of the vines peaking out through a gorgeous stately entrance complete with a lead light glass sign. The buildings are equally impressive with no dollar spared - this is a loving tribute to wine and food from a man who has the funds to build his dream wine destination. The copper rooves and sandstone architecture hark back to his Italian roots. The main grounds offer a huge number of events for locals and tourists to engage in fun and frivolity including regular concerts, dances and wine tastings. If you're bringing a family try visiting during the Summer months when the pool and cabines can be booked for some kid friendly fun while you enjoy the local wine. One of the main attractions is a museum devoted to Coppola's directorial career with one of a kind displays of costumes, props and accolades. I might love wine but this was the highlight of the visit for me especially with so many of the the goth fantasy Dracula items on display. We were really here to have lunch and try the wine though, our basic visit structure was to speak to the hostess at the restaurant and get in line for a table, then spend the wait looking at the museum. If you've spent half an hour looking at the museum and then get asked to wait another half hour this will lead to cranky hungry people. The entire place is decked out with old school charm. I am particularly fond of the dark wooden bar with its classically trained cocktail staff and glorious Italian espresso machine. The restaurant itself Rustic looks a little like an Italian steakhouse but with gorgeous Californian views and an airy high ceiling. The menu highlights Francis' favourite meals along with many Italian classic rustic dishes. Zinfandel to me is a uniquely American wine, it's something I'd never really encountered before moving to the United States and it's still growing on me. This is definitely a food wine and would benefit from a few years grace but nonetheless it's an enjoyable tipple with an Italian meal. 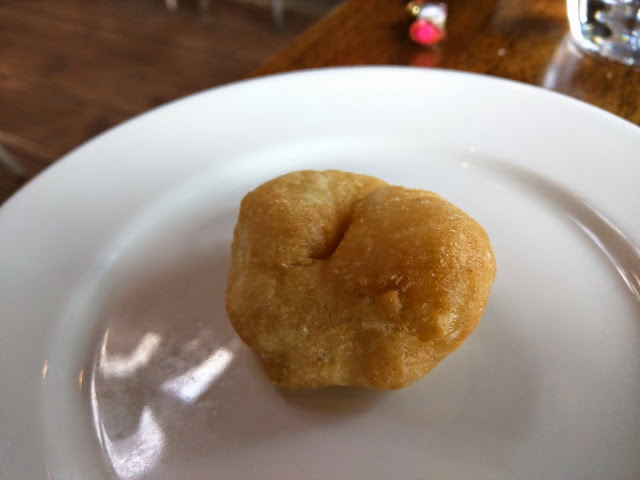 A fried doughnut style bread product filled with a melted cheese, not too oily or too rich but just right! 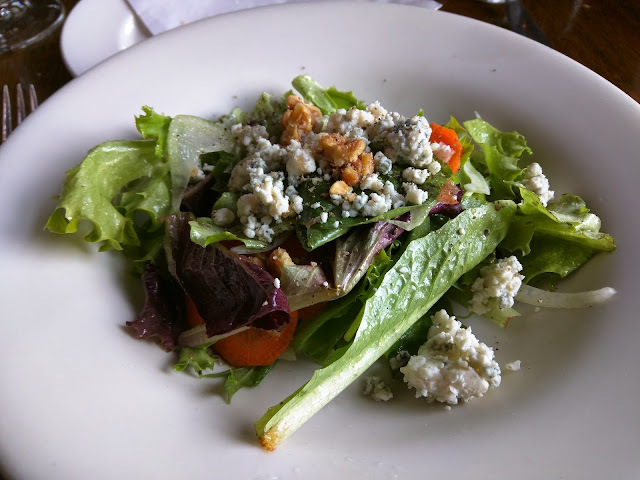 This was a lunch special included in the 3 course selection that we chose but anything that features that delicious local blue cheese is fine by me. Other salad offerings are primarily American rather than Italian classics like Cobb Salad. I admit I spent a great deal of this meal trying to understand the pasta shape having never seen a bumbola noodle before. Some research proves that the name is given for the "bumblebee" shape and that the pasta is made custom for the Coppola brand. As well as being served in the restaurant it can be purchased retail in the kitchen store on site it is recommended for heavy sauces (rather like a large pasta shell). Served in a wine, fontina and cream sauce with broccoli rabe and loose sausage mince this is a very rich dish with a smooth but bitter end. As well as the rich sauce the pasta is very weighty - I can only manage a few noodles before I'm full. Both the pasta and sauce are delicious though, the simplicity of the meal means that all the focus is in the quality of the ingredients and I am not disappointed. 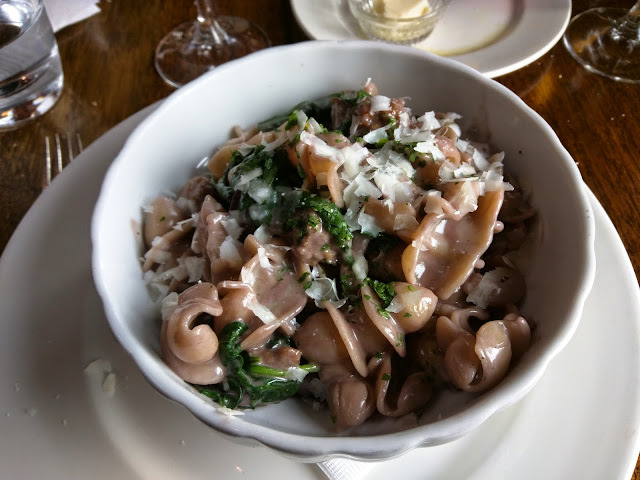 Sometimes the simple things in life are best and while this might seem like a comfort food classic it is a great dish to order. 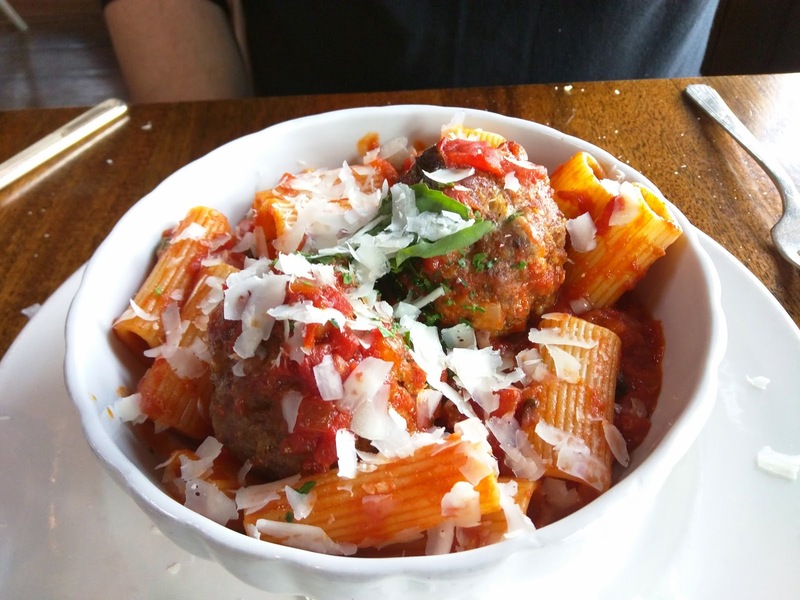 Thick doughy pasta is perfectly al dente and served with freshly made meatballs (I want to say veal and lamb?) with flakes of real Parmiggiano Reggiano. A simple classic dish served exactly as it should be. After you're done eating check out the kitchen store with high end oils, pasta and sauces, utensils and cook books as well as cute souvenirs. 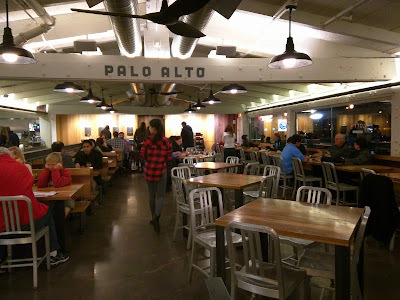 The entire place is well worth a trip, even if you're not a big wine lover for a simple meal made with a love and a great side stop on a roadtrip for the whole family. Kids, food lovers and movie fanatics will all be satisfied! 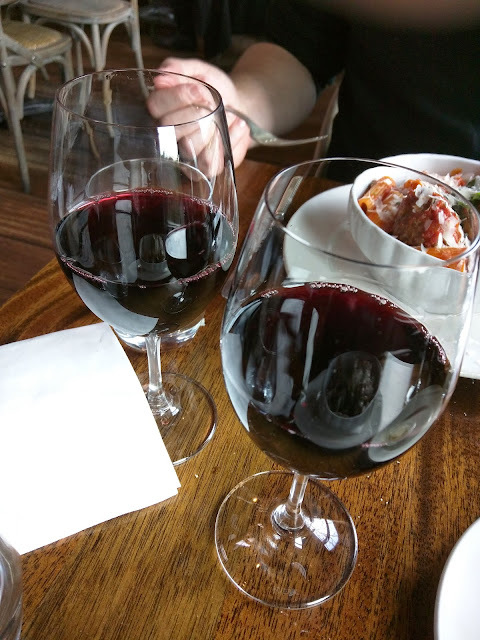 Being so close to wine country in California it seemed amazing that we hadn't made more of an effort to explore the fantastic cheese and vineyards nearby so we made a weekend of it and visited some highlights around Sonoma County. We stayed at a local apartment hotel not far from Healdsburg and used this as our central base. I'll follow up with some more places that we visited but this town really had that "couple's weekend away" vibe down to a tea. Downtown Healdsburg has that quaint small town America feel with old style brick architecture and a delightful central square - like something straight out of the Gilmore Girls but on the West Coast. Antiquing is a past time that could easily be a real habit if you lived nearby, there's plenty of these cute little knick knack and furniture stores mostly owned by older families or gay couples who've moved north from the hustle of San Francisco. Sadly the prices are reflective of the tourist nature of the town and the nearby Silicon Valley dollars - no bargain basement prices here! There are plenty of other local sites to see like this Fan Museum which was sadly closed on the day we visited. Numerous local wineries have store fronts in Healdsburg and offer tastings at very reasonable prices during the day. We're really here for rest and relaxation but you can see many people hopping from one show room to the next trying many tipples. You could easily spend an entire day or two just trying different tasting rooms, but we limit ourselves to just a couple. A full list of all the showrooms can be found on the Healdsburg town website. Kendall Jackson are well known for their Californian classics like Chardonnay, Pinot Noir, Cabernet Sauvignon and Syrah. The style of Syrah found in California is very similar to the Shiraz (same variety, different name) found in Australia due to the similar climate. Portalupi wine is a much more Italian style wine, good with food but probably a little strong for my tastes. They focus on casual approachable wine with an Italian flaire like Vaso di Marina which comes in a unique milk jug familiar to those of us who buy organic milk in California. They have a very casual tasting room and feature tasting plates to try with the wine. The town is also filled with great coffee shops, featuring local and freshly roasted coffees like this Flying Goat Coffee house. Not a Starbucks to be seen (phew!) Try picking up a book from one of the many local stores and sit down for a peaceful brew. One thing I love about small town America is the great diners and all day breakfasts that can be found. We've earnt a good meal after all the walking around and the Center Street Cafe and Deli doesn't disappoint. 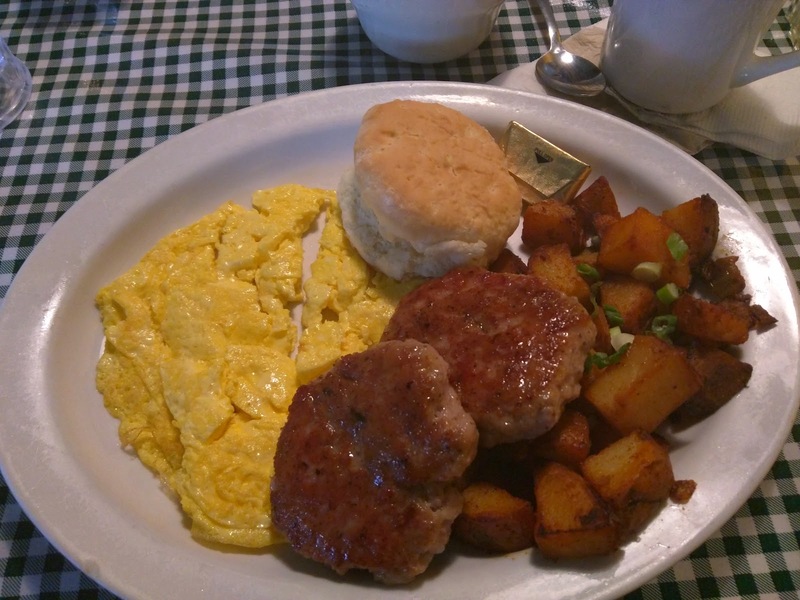 It's all cutesy Americana with 1950s original signs on the wall and a sausage and biscuit breakfast plate with bottomless cups of coffee. Sadly it looks like this diner has closed since we visted but there were plenty of other local stops with similar fare. We have an apartment with a full kitchen though so we're keen to cook some of the amazing local produce rather than eat out after a day of site seeing and snacking. The locals recommend we stop by Big John's Market which is a little like an independent WholeFoods Market. The entire shop is stocked from top to bottom with local oils, wines, coffee and more, it's a foodies paradise. 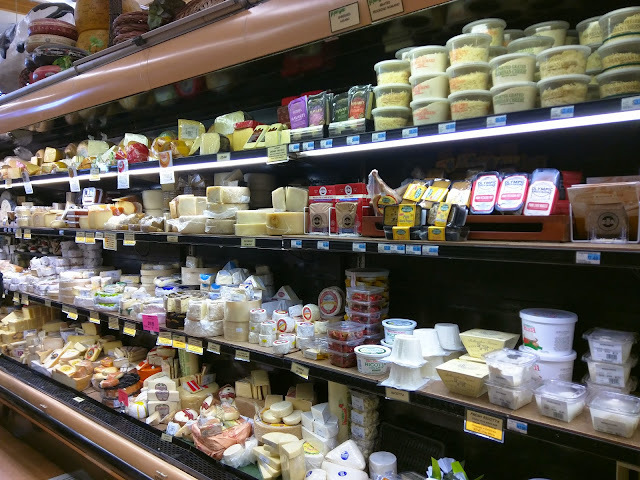 The best part though is the cheese cabinet which is an entire row of delicious morsels. There are fantastic local Sonoma Cheese like Cowgirl Creamery, Point Reyes Farmstead, Marin French Cheese Company, Bodega ranch and Cover Stornetta many of which feature regularly in our fridge at home! If you're interested in knowing more about local cheeses then defintely check out the Sonoma Marin Cheese Trail with details of dairy openings and tasties. My favourites have to be the Point Reyes Blue and the Cypress Grove Truffle Tremor and the quality of goats cheese in Northern California is unparalleled outside of Europe. 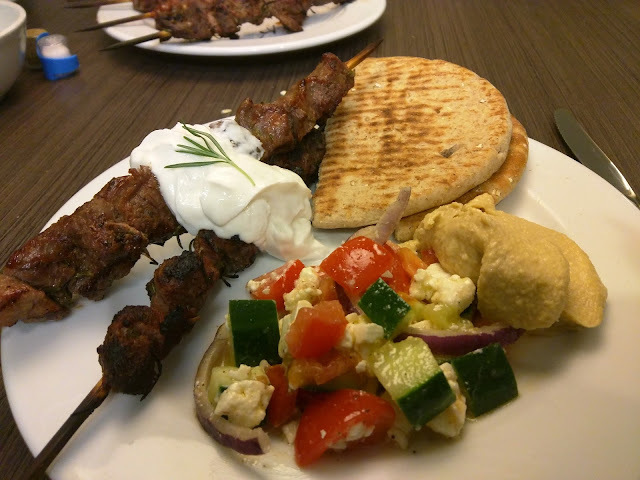 They have great local produce and an amazing butcher at Big John's inspire us to make lamb souvlaki with greek salad and pita. Yum! There is so much food related tourism in this town you could hardly fit it in in one day. Charcuterie and cheese places, coffee shops and restaurants featuring local produce abound. If this has given you a taste for a cute little town and the perfect weekend getaway then check out the chamber of commerce's town map featuring all the places fit to eat and see! 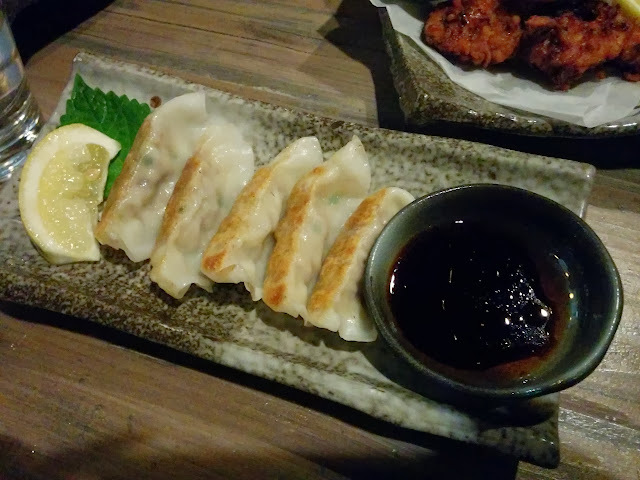 Izakaya are Japanese gastro pubs that serve up small tapas style plates that pair well with your favourite drink or 10. 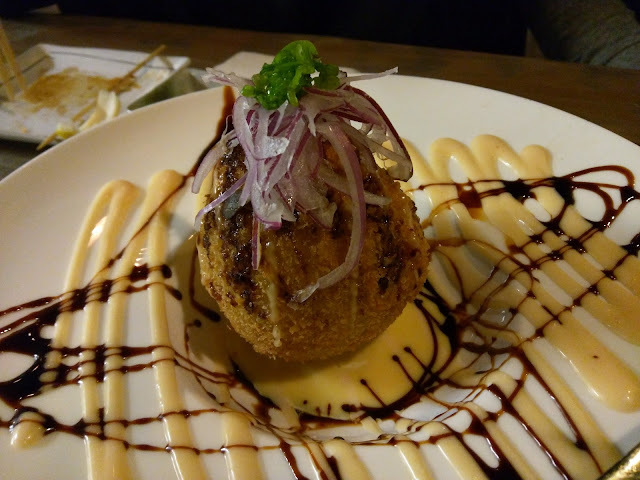 Unsurprisingly this makes it one of my favourite cuisines, and in particular it's great for large parties where everyone can find something to nibble while you chat and drink. 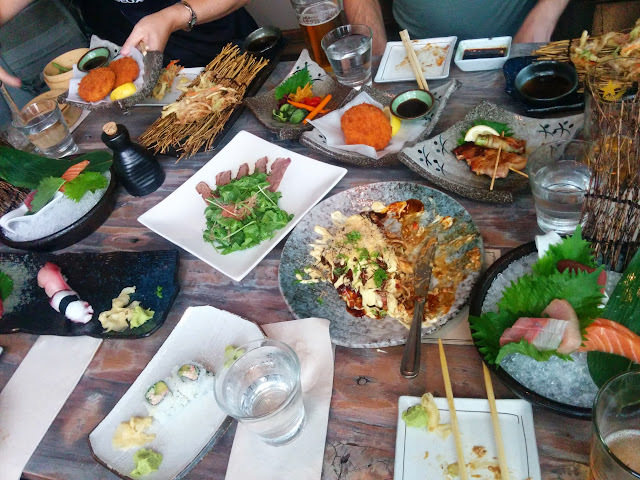 Izakaya Kou is one of my favourite establishments to take visitors to San Francisco. 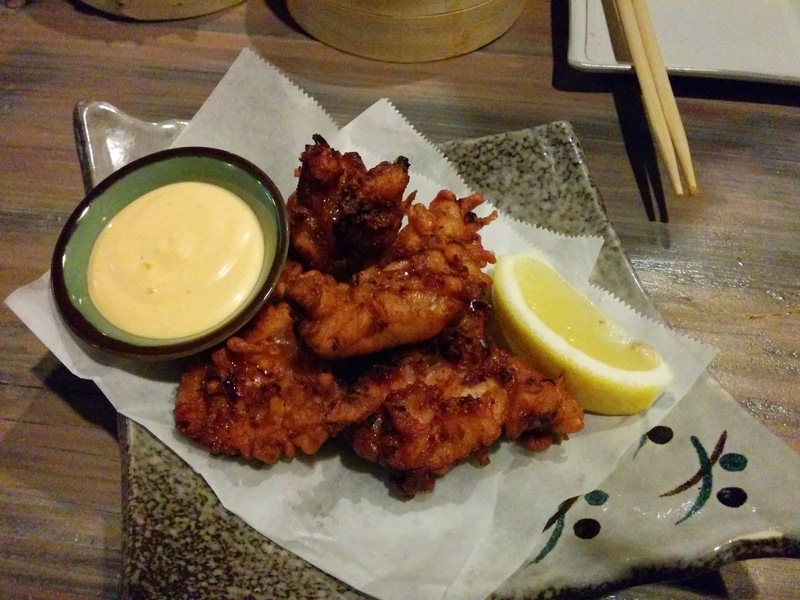 There's great nibbles, import Kirin on tap and it's not far from our house in Japantown. 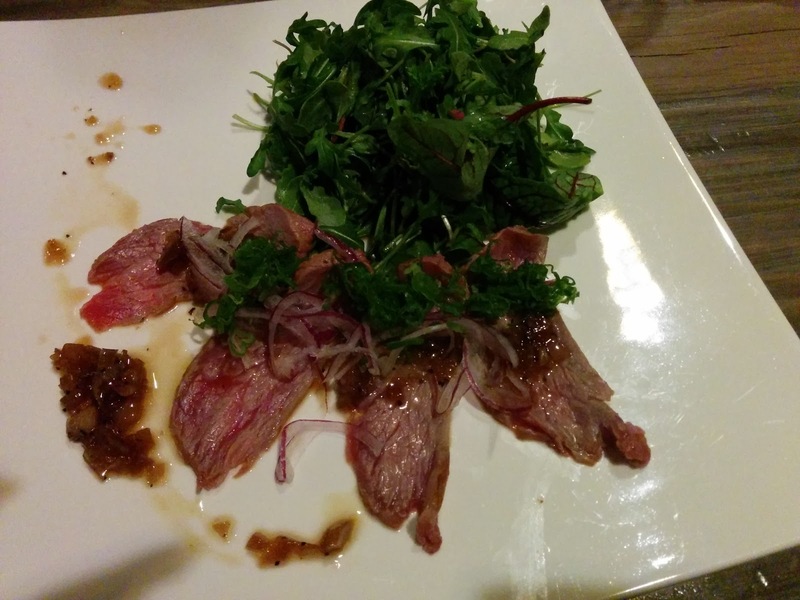 Kou makes a great stop for work drinks or after a theatre visit in Japantown or the Fillmore district. The plates are fairly small which allows you to have a little bit of everything, buy a table full and share with your friends! 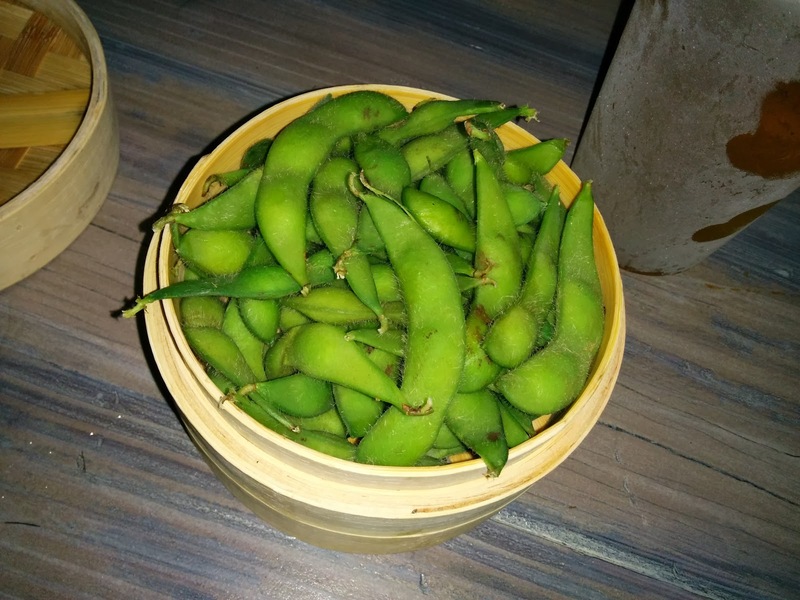 Boiled salted edamame are beloved by just about everyone and the fresh sea salt makes the ice cold beer go down faster. 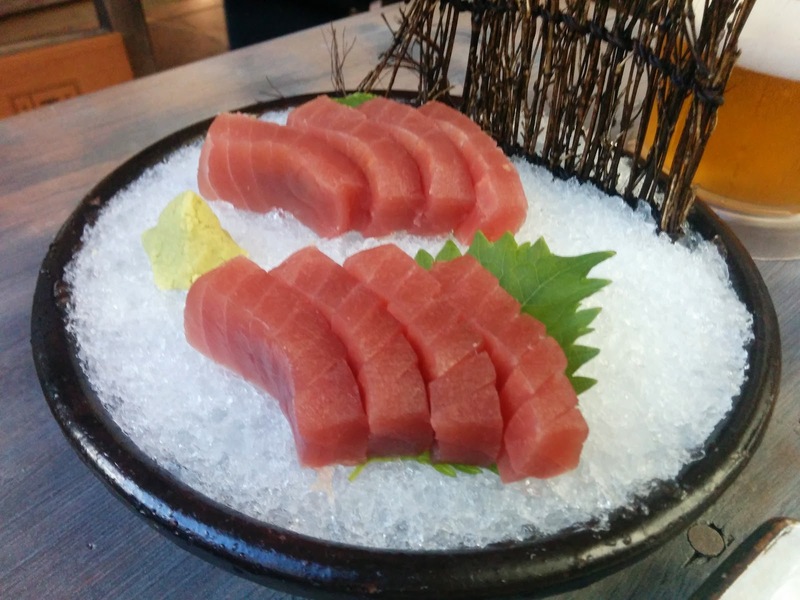 Raw tuna is one of my favourite things in the world. Sadly I think this tuna has been frozen but is still well textured and tasty. 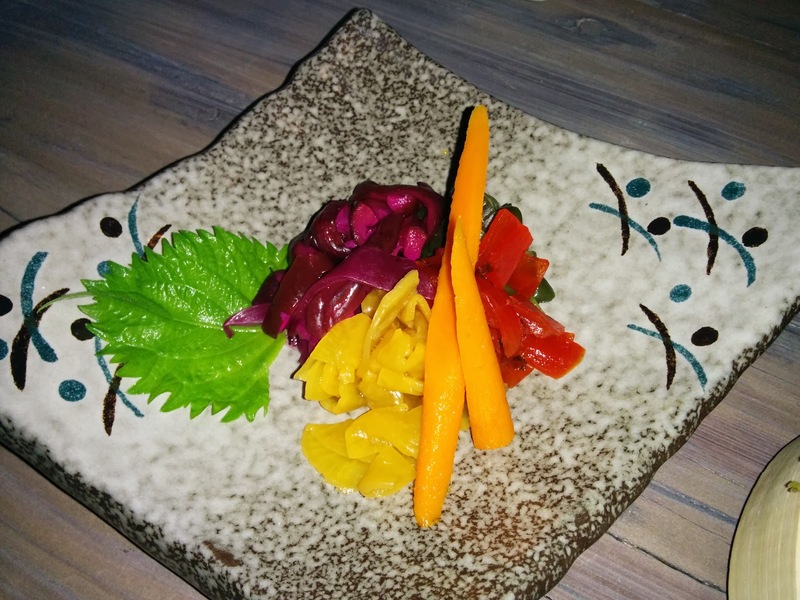 There are a number of healthy alternatives like this sashimi, vegetables and vegetarian sushi if one is trying to eat sensibly, though that can be hard when everyone else digs into the beer and fried delights. 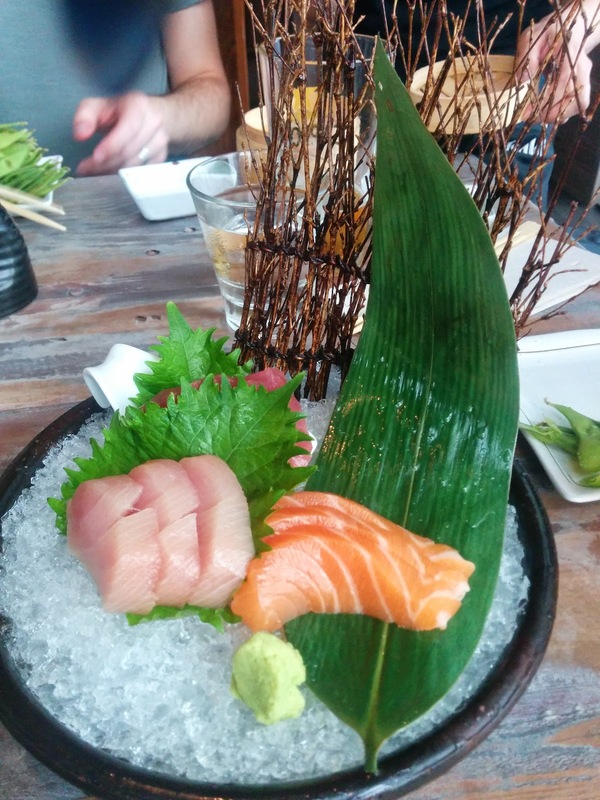 Raw salmon, big eye tuna and yellowtail are served on a fresh bed of ice with shiso leaf and wasabi. The fish is fresh and reasonably well cut and the decoration is sweet even if inedible garnishes annoy me. Who doesn't love dumplings and beer? 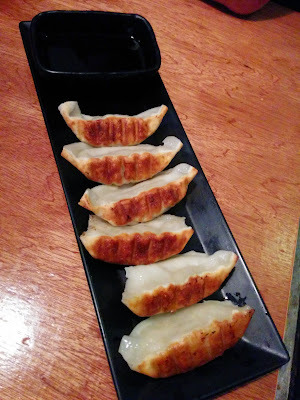 These gyoza are freshly made with super thin skins and a light pork filling with lots of scallion. If you're not adventurous these are delicious for any age and contain no seafood. Once the drinking starts it's time for some fried food. Their karaage chicken is slightly spicy but lightly breaded in a sesame batter that is crisp without being too oily. The spicy pepper aoili that comes with it is not traditional but is simply delicious. 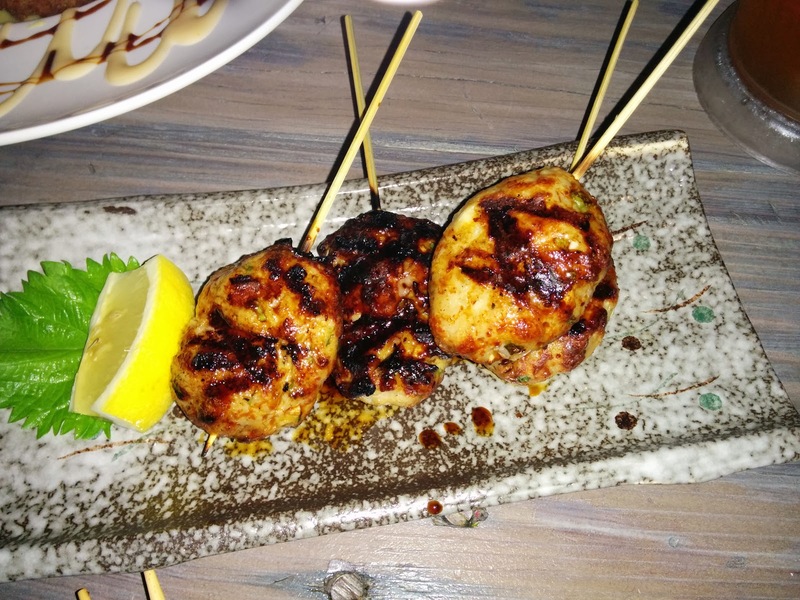 Tsukune are one of my favourite bar snacks that we discovered after a boozy night out in Kyoto. Ground chicken is spiced with garlic and ginger and then grilled with a sweet barbecue sauce. I generally recommend several of these since they disappear in a snap. Okonomiyaki is some of the best drinking food there is. Mixed vegetables are stir fried with egg then formed into a cake (think Japanese bubble and squeak) and doused in toppings. The okonomiyaki at Kou is made with American smokey bacon which pairs swimmingly with the sweet sticky sauce and mayonnaise. Topped with heapings of shaved dried tuna, scallion and seaweed this is all kinds of savoury deliciousness. 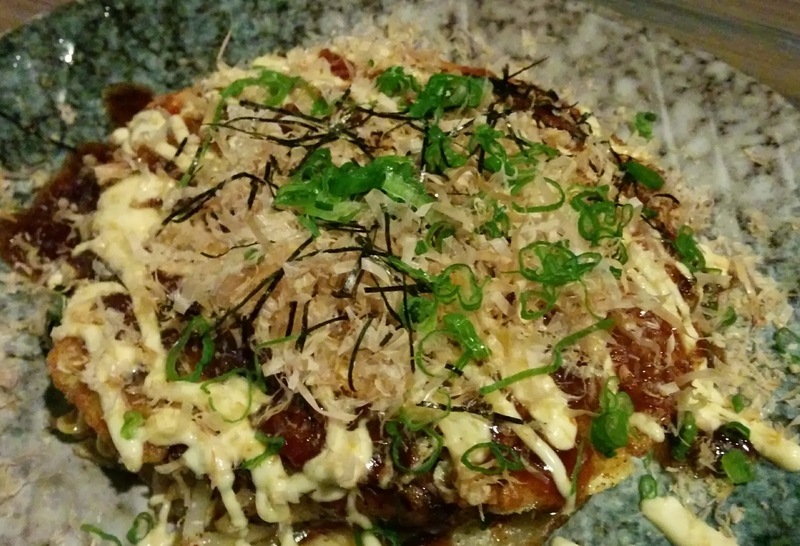 Okonomiyaki is very hard to find in the US and this is a great rendition. Raw beef is lightly seared and served with red onion and a lovely herb salad. The beef is corn fed but the preparation is very nice. 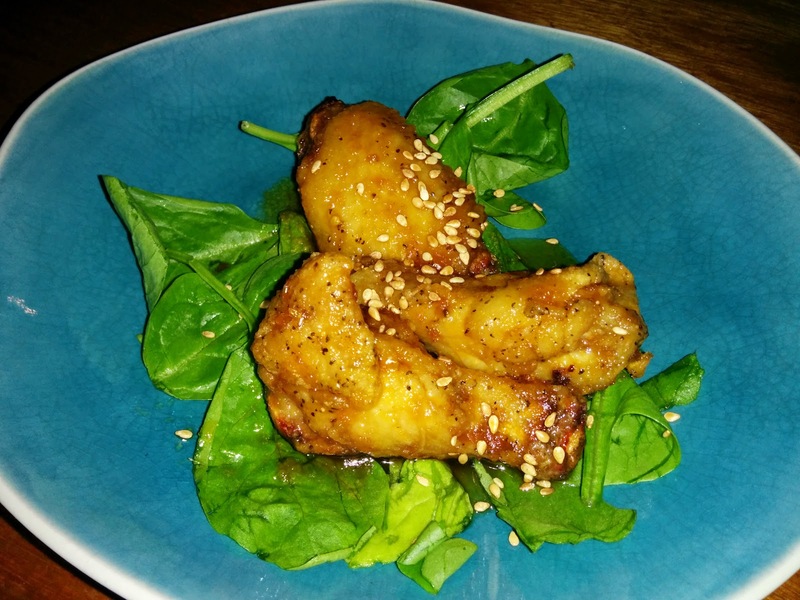 This is their winning dish, soft morish and delicious, fried but not heavy yet sticky and savoury. 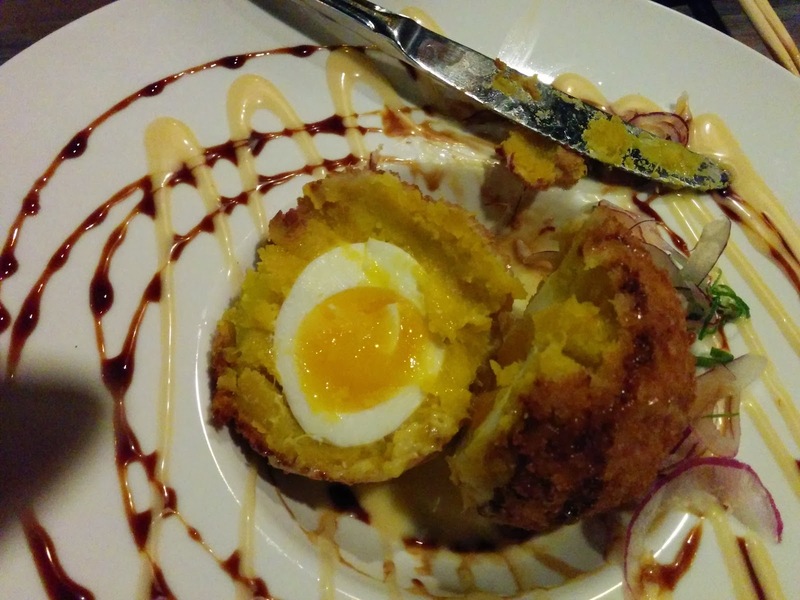 Prepared a little like a vegetarian Scotch egg with a soft boiled egg in the middle covered in mashed kabocha squash, breaded fried, then covered in sticky okonomiyaki sauce. Yum! Izakaya Kou also has some more standard Japanese fare like soba or ramen noodles, sushi and tempura. There are plenty of vegetarian options like salads, gratins and tofu dishes. They also have a fair number of grilled meat options like bacon wrapped asparagus, kurobuta pork sausage or crispy pork belly. 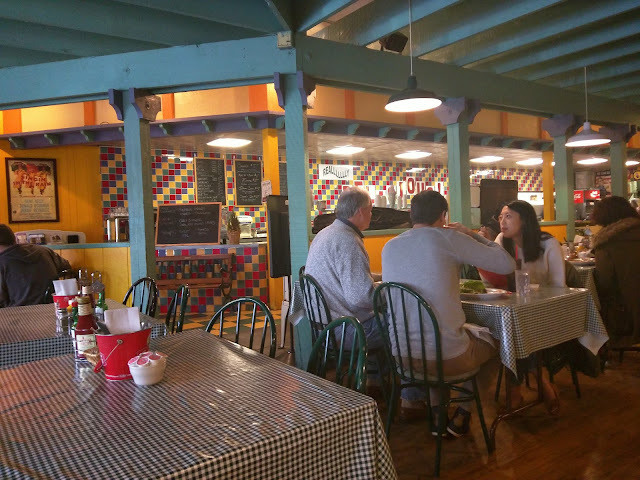 The staff will also bring gluten free soy and other options if required, all in all this makes it a great destination for groups with varied food requirements. Admittedly the service can be a bit variable; on the weekend they sometimes seem overwhelmed but as a mid week destination for a small group or a date it's a great option. There are small party rooms available for those seeking privacy - booking is recommended and a $200 minimum spend is required. One of the catch cries of Silicon Valley is "You always have email, there's always traffic on the 101" so there's little point in checking the notifications on your phone, tablet, smart watch or whatever gadget you happen to be obsessed with this week. Sometimes when the Valley gridlock gets too much we pull over for some peninsula eats instead of cursing the traffic and on one such evening we discovered Gott's Roadside. This isn't a super fancy fernickity place just great diner food done really well (though admittedly with a Bay Area price tag). A modern Californian take on the diner with polished concrete floors, exposed beams and industrial tech metal furnishings are to be found everywhere. Still with all that classy Palo Alto interior decorating it's still one roll of Formica away from being Mel's Diner in spirit. Onion rings, blue cheese and bacon make this South Western style burger one of my favourite combinations. 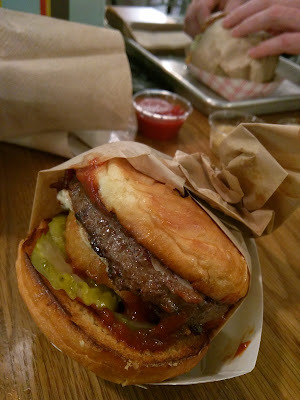 With good quality fresh beef and a crispy chewy brioche style burger bun this is easily the best burger I've found in the Bay, beating even Counter Burger for deliciousness. Many options are available for burgers including Patty Melts, Sourdough Mushroom, Green Chile as well as Hot Dogs and hot Chicken sandwiches. Looking for something not in the form of a sandwich? Try a salad, chilli, tacos or fish and chips. Great quality casual road stop food, morish and filling! 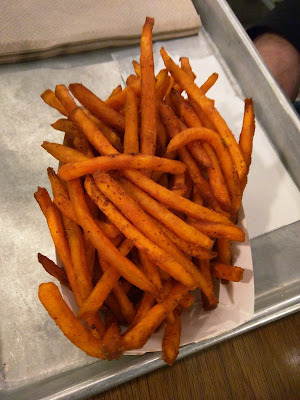 All hot dishes other than the hot dog range from $10 - $15 and do not include sides so beware sticker shock, this is no dollar menu burger stop. 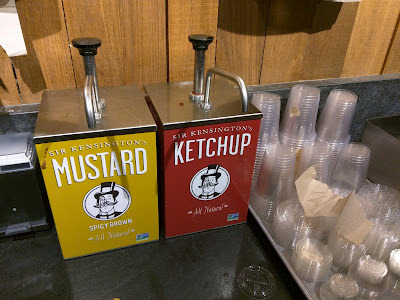 I especially love the organic Mustard and Ketchup on hand. 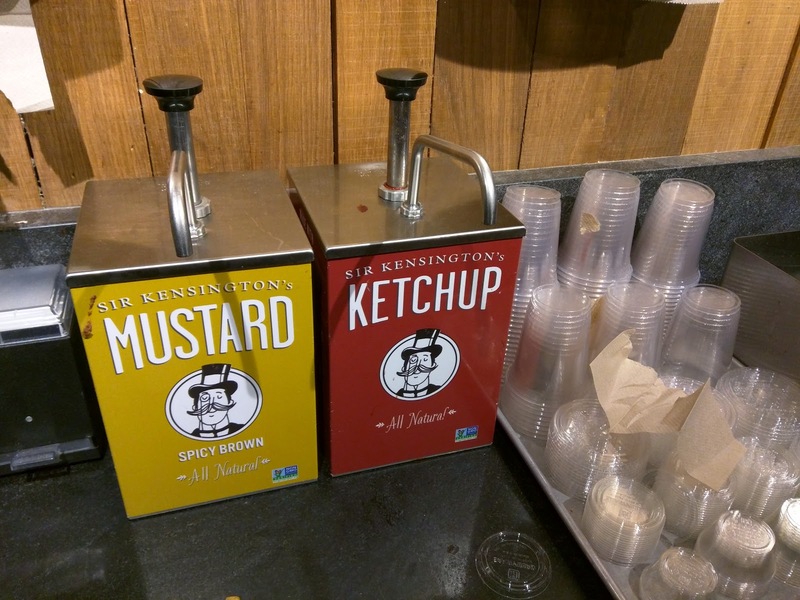 As well as the cute Sir Kenningston's logo these condiments are ethical and free of high fructose corn syrup giving them the real taste of non-US ketchup without that high fructose aftertaste. 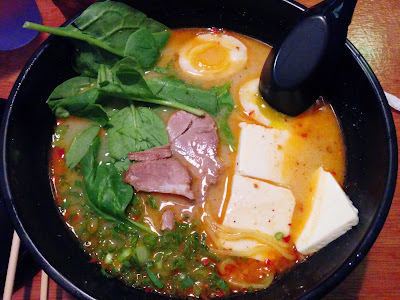 Continuing on our mission to eat all the ramen in Japantown in San Francisco is Ramen Underground which has actually become a staple for us. 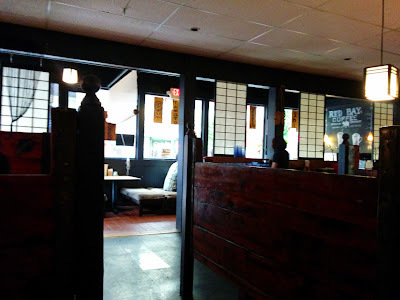 The cute little izakaya style restaurant is tucked at the top of the Japantown shopping centre away from the maddening crowd during Summer festival season. The decor is decidedly traditional Japanese izakaya style with dark wooden fences and paper screens throughout. Not amazing quality but definitely hand made fresh regularly. You can get them steamed or fried or even on top of your ramen. 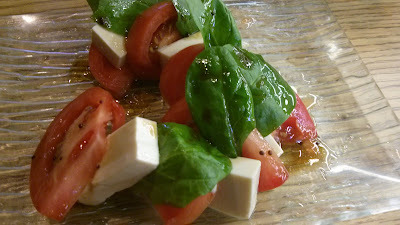 As someone who has trouble with dairy this Asian take on Caprese salad is perfect as a side for hot soup or during the warmer months. 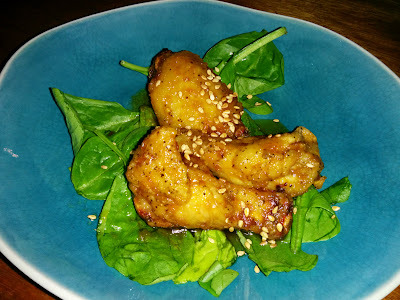 Not quite buffalo not quite karaage these wings are slightly spicy with no heavy bread coating and a hint of sesame oil. This cold ramen salad is a little deceptive as the sesame mayo dressing is far spicier than first appearance would allow. 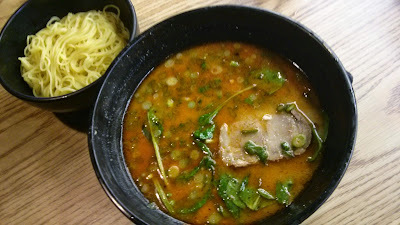 Served with cold corn, mushrooms, greens and a slice of roasted pork this is a great Summer alternative to hot soup. I find their miso soup a little thin, lacking the collagen that I like in a ramen but the miso is good and the tofu is fantastic. 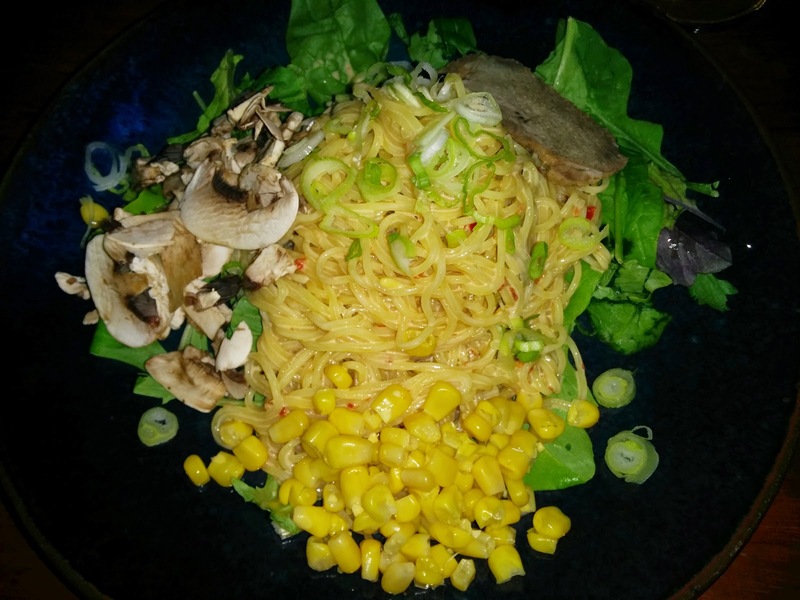 I do wish they would put more toppings in their ramen though since I feel I have to add multiple things before I get a full meal. Phew this is all for my man and not for me; I like spice but not the sharp green flavour and afterburn of the Habanero. He however thinks this is the best ramen known to man. Add in an egg and a lot of scallions and he is a happy happy diner. 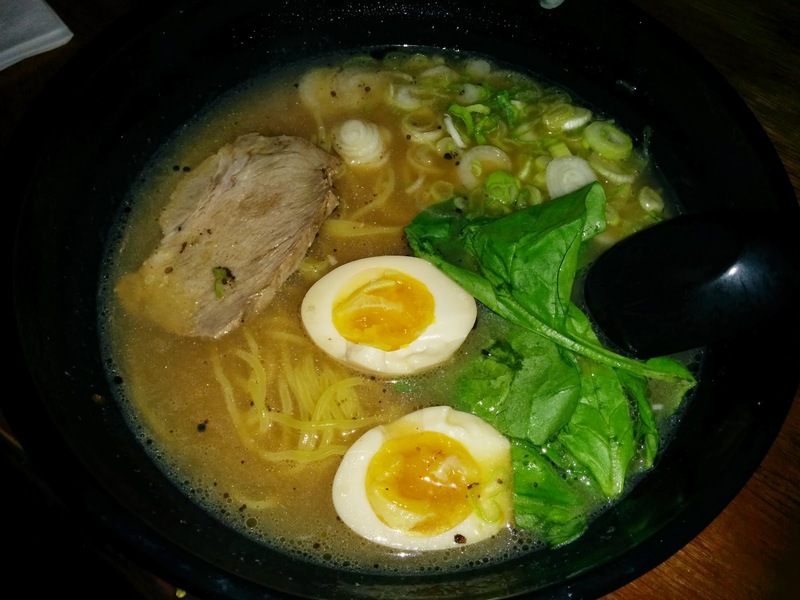 Again the tonkotsu needs a little more depth and thickness for my taste but it is a very good broth and not too heavy on the stomach. Good quality soft boiled eggs and excellent tofu round out the dish. 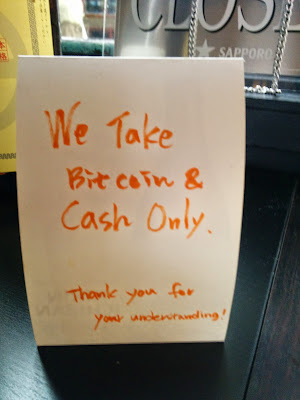 This is how you know you're eating in San Francisco. The food is very good but the service can lack a little, they tend to hire Japanese students who don't always have restaurant experience. That said it's a great little lunch date place and conveniently placed near the Daiso and Kinokuniya making it a great place to sit down and review your purchases in or rest your weary feet. 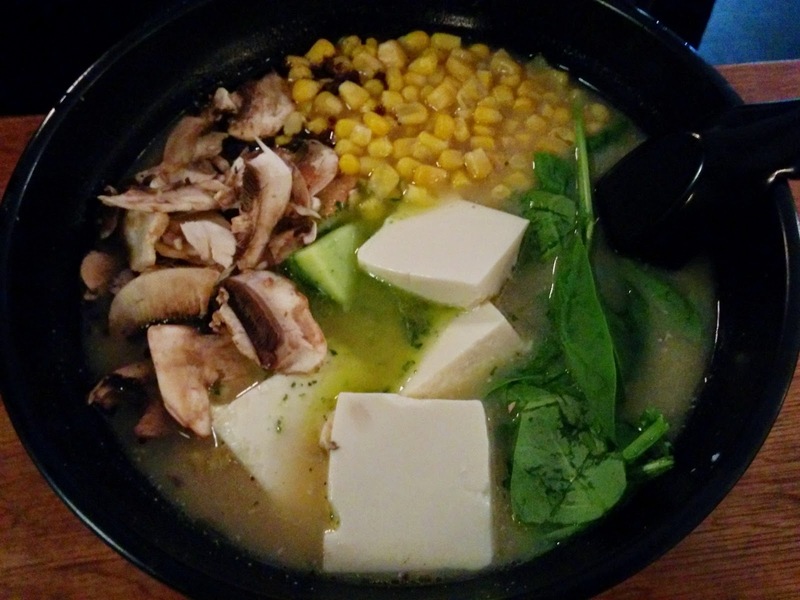 This is also one of the few places in Japantown that will do a vegetarian broth making it a good option to take vegetarian and vegan friends.